5 days left! We've been having a debate today over whether Pimms or Sangria is the best holiday drink?? What do you think? But first- let's pack! Here are our tips on how to pack for a road trip and how to stop rattles in your motorhome! There's nothing better than the excitement of setting off on a new adventure! There's nothing worse than getting 2 miles down the road and the noises from the back of the motorhome as you go over every bump and hump are deafening! Here's a quick video on how we stop rattles in our motorhome in the kitchen- which, let's face it, is by far the biggest culprit!! Put breakable things somewhere secure. I know it sounds obvious- but I'm the idiot who put our wine glasses on a shelf because “they look pretty”. Not for long, they didn't! Keep weight as low as possible, and forward if you have a front wheel drive. ie- put tins in a front locker, not right at the back. Keep things you use regularly as accessible as possible. 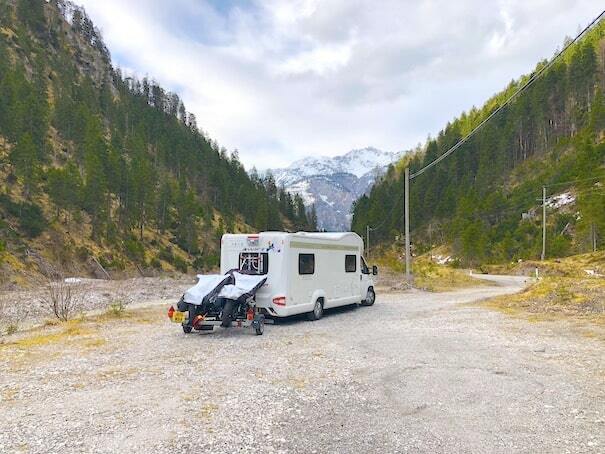 The more annoying it is to get to something, the more annoying motorhome life will be. Try to make things easy for yourself. In the same vein, if you put ‘naughty' treats in an inaccessible locker, you're going to have to REALLY want them to get them out. It works surprisingly well! Here's us, preparing for our 6 week trip to Norway and buying 6 weeks worth of food!! I honestly didn't think it would all fit in… but it did! Oh- one last TOP TIP. Write the name of the contents of each can (and the expiry date) on the top with a [amazon_textlink asin='B002LSNM68′ text='Sharpie' template='ProductLink' store='wanderingbird-21′ marketplace='UK' link_id='5a770686-8932-11e8-bc64-bddc3c988f43′] or permanent marker. This will allow you to easily see what's in a locker without having to empty it all out. I stack my cans 3 high and I try to stack the same thing on top of each other so I can find things easily. As the locker gets emptier, this gets harder- you also need to pack the locker so things don't rattle. I also write down the contents of my food lockers and try to remember to cross off things as we use them. It helps me see easily what food we have onboard, which helps with meal planning and shopping. Hi, I’m finding your Norway and general motor home hints and tips very useful. We are new to motor homes, having been caravanners for around 30 years. Just putting my three penny worth in – why don’t you use the oven space for storage? I actually store our oven trays and grill pan in there, nested into each other and covered in tea towels of course. I also use the microwave to store plastic containers – wrapped in Bubble wrap. I did take on board the way you packed your utensil tray – brilliant. We tuck the glass plate out of the microwave under some cushions on the bench seats – it has always been safe. My daughter puts it vertically between the bench cushions. I also loved to hear about how much you managed to get into the gas locker! Very informative, we will be trying those out next trip. We are off to Norway in May for 6 weeks and are hungrily devouring any or all hints on what to take with us. Thanks again. Hi Sue- great tips there!! We don’t use the oven, purely because we don’t need to at the moment- we manage to have enough storage without it. But it’s a perfect space to keep things if you need to- just remember to take them out before lighting! 😉 Hope you have a fantastic trip!